In 2004, the United States Postal Service® introduced a digital proof of delivery service known as “Return Receipt Electronic” (RRE). RRE provides a similar level of service to the traditional Return Receipt (RR) service that delivers a physical “Green Card,” instead it offers a digital copy of the recipient signature as proof of delivery. From the start, RRE was more affordable than the traditional return receipts service but there have been some concern about the delivery service option when mailings have been challenged in court. The USPS® introduced Certified Mail in 1955, and during the six decades since, communication has been revolutionized by the instant and affordable access provided by digital technology. RRE harnesses the connectivity of the Internet to alleviate the Certified Mail workload somewhat by eliminating the need to file paper Return Receipt “Green Cards” and offering a $1.25 savings per mail piece. But even in a digital age, the old-fashioned Green Card remains as relevant. Its use is required by civil codes across the country and, there is still profound value in its physicality: You can file it with the original wet signature and it never goes offline. As the largest private provider of Certified Mail services in the U.S., we are in a unique position to appreciate and evaluate the effects of both RR and RRE. Many of our clients process foreclosures and other types of notices for loans in default, where the standards for customer communication are high and the debt balances at stake are equally significant. In those situations, — the need to evaluate the legal requirements around proof of mailings in the specific state or locality will determine whether the electronic return receipt signature meets the legal requirement. In cases when actual wet signatures are not required, many WALZ Certified Mail Automation clients have used RRE successfully to demonstrate proof of mailing, even when challenged by the courts. However we see clients’ continued use of RR when they have determined that the risk may be too high. For example, a client working within the Ohio Courts decided to use RRE service, only to find that some judges rebuke the service because of their personal opinions of its’ validity. However, there are jurisdictions in New Jersey that accept RRE as legal proof of mailing in foreclosure case proceedings. So the key is, you must do your research before making the switch. In practice, the crucial difference between traditional Return Receipt and Return Receipt Electronic is the method for obtaining the proof of delivery signature. USPS considers both RR and RRE to be equivalent services for obtaining proof of delivery via Certified Mail. Acceptance of each service type varies by individual courts and localities. Return Receipt Electronic and traditional Return Receipt service both come with advantages and disadvantages, which vary in significance depending on the situation. 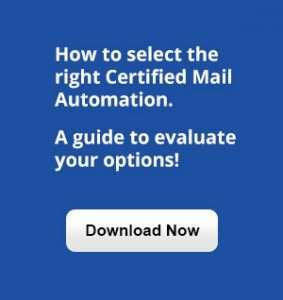 In deciding which service to employ, users of Certified Mail should evaluate the nature of their communications, the regulatory and legal environment, and weigh the necessity of hard-copy verification (RR) versus the cost and efficiency savings of $1.25 per mail piece (RRE). At WALZ Certified Mail Automation, we are the largest private provider of Certified Mail services, and are in a unique position to appreciate and evaluate the effects of both Return Receipt and Return Receipt Electronic. 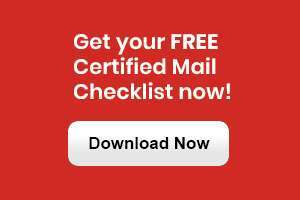 Ready to start saving time and money with Certified Mail? From Fortune 100 companies to small businesses around the U.S., WALZ is the trusted leader in Certified Mail Automation. Since our earliest days in the 1980s, our products have helped thousands of offices across the nation save time and money on more than 300 million transactions.